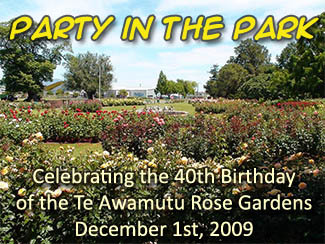 Tuesday, December 1st 2009 marked the 40th birthday of Te Awamutu Rose Gardens — and everyone was invited to a Party in the Park to celebrate. Unfortunately the weather didn't cooperate and the party was moved to the Te Awamutu Events Centre. Celebrations began at Te Awamutu Museum with the opening of a new exhibition ‘Cowtown to Rosetown’. This exhibition marked ‘a remarkable community venture that led to the branding of the town itself’. It included a series of historical photographs tracing the gardens’ development, many from the archives of the Te Awamutu Courier, as well as a set of contemporary images by esteemed nature photographer Phil Brown. The Museum had a unique initiative around the exhibition — all framed photographs were available for purchase by silent auction. Guests joined the party at the Museum between 3.30 and 5pm for strawberries and champagne to celebrate. The party atmosphere continued at the Events Centre with fun and entertainment thanks to Waipa District Council, Te Awamutu Community Board, Waipa Community Arts Council Creative Communities and Te Awamutu Alive’s Christmas Spirit Committee. Conceived and organised by Dean Taylor, the party kicked off from the main stage (appropriately adorned with rose arrangements from members of the Rose Society) at about 6pm with a welcome followed by Community Christmas Carols led by Te Awamutu Brass and the Christmas Choir — and of course Santa Claus was there for the kids. The MCs, band and choir led the event, and there were items from St Patrick’s School, Waipa Christian School and Te Awamutu Bible Chapel. The Christmas Party switched to a Birthday Party for Te Awamutu Rose Gardens with speakers talking about the background and history of the gardens, including of course Te Awamutu Rose Garden project convenor Ray Hyams. There was an address from Waipa Mayor Alan Livingston and Te Awamutu Brass performed Rosetown March written by band member John Gibbons. Opera in the park followed with performances from soprano Alice Gower, tenor Michael Petrus and 10-year-old Katie Trigg — accompanied by pianist Gabrielle Peake. The programme included solo and group items, with The Flower Song from Carmen by Michael Petrus as a special piece to celebrate the anniversary of the gardens. The evening concluded with the announcement of a ‘gift’ to Te Awamutu Rose Gardens from Te Awamutu Rose Trust and Te Awamutu Rose Society. The gardens now have a permanent lighting setup to be used throughout the Summer months.